Есть вопрос для Banthai Beach Resort & Spa? Удобно расположенный в районе для пляжного отдыха, ночных развлечений, шоппинга, города Пхукет, Banthai Beach Resort & Spa обеспечит все необходимое, для того, чтобы гости смогли расслабиться и отдохнуть от дневной суеты. Отель находится недалеко от центра города: всего в 17 KM, и обычно дорога в аэропорт занимает около 45 минут. Для осмотра достопримечательностей и интересных мест в округе, не нужно далеко ходить, так как отель находится недалеко от John International Tailor, Тренинг по тайскому боксу, Пляж Патонг. Обслуживание и удобства, предлагаемые в Banthai Beach Resort & Spa, обеспечат приятное пребывание для гостей. Лучшие услуги отеля включают обслуживание номеров 24/7, камин, бесплатный Wi-Fi в номерах, сувенирный магазин, охрана 24/7. 290 номеров, расположены на 4 этажах, где вы будете чувствовать себя как дома, в теплой и уютной обстановке, с такими современными удобствами, как телевизор с плоским экраном, отдельная гостиная, Wi-Fi (бесплатный), джакузи, номера для некурящих. В отеле можно найти полный спектр услуг для отдыха и развлечений, в том числе гидромассажная ванна, фитнес-центр, сауна, внешний бассейн, спа. Получите удовольствие от первоклассного обслуживания и широкого выбора услуг в Banthai Beach Resort & Spa. За детей в возрасте от 4 до 11 лет (года), при размещении на имеющихся кроватях, взимается плата в размере 600 THB - за ребенка за ночь. За детей в возрасте от 4 до 11 лет (года), при размещении на имеющихся кроватях, взимается плата в размере 1,200 THB - за ребенка за ночь (завтрак включен). Максимальное число детских кроватей, устанавливаемых в номере, — 1. В номере можно установить только 1 дополнительную кровать. Детская кроватка или колыбель предоставляется при наличии возможности. Стоимость завтрака для детей составляет 200 THB. Хороший отель с отличным персоналом останавливались на 2 ночи, номер хороший , все рестораны и сам пляж находиться рядом с отелем , из минусом платный интеренет и нету вида на сам пляж , номера выходят на басейн. I stayed this hotel for 3 nights. However, the air conditioning was only fixed after two nights of stay. The great thing about this hotel was I complained to the front desk and they offered me an extra room on the new wing without any charges. Great location, staff was easy to work with, breakfast buffet was amazing, we booked a suite and it was totally worth having the extra room. I love that the hotel was was set back from the street so it was quiet, but all the local fun was easily accessible! We would definitely return if we get back to Phuket! Heard through the grapevine that the Hilton Garden Inn will be taking over. Boooo. The spa was also excellent, we had 3 thai massages when we were there and the therapists were excellent. the hotel is amazing, the staff were amazing and we were lucky enough to be upgraded to the suite. the location of the hotel is incredible, right on the beach and perfectly tucked away from the busy road. the staff made us feel incredibly comfortable and we will sure be coming back again. The location was great, right next to the Patong beach. Access is great, and the breakfast was better than another 5 star hotel I have stayed around in patong. You will get relaxing time and great service from every staff. 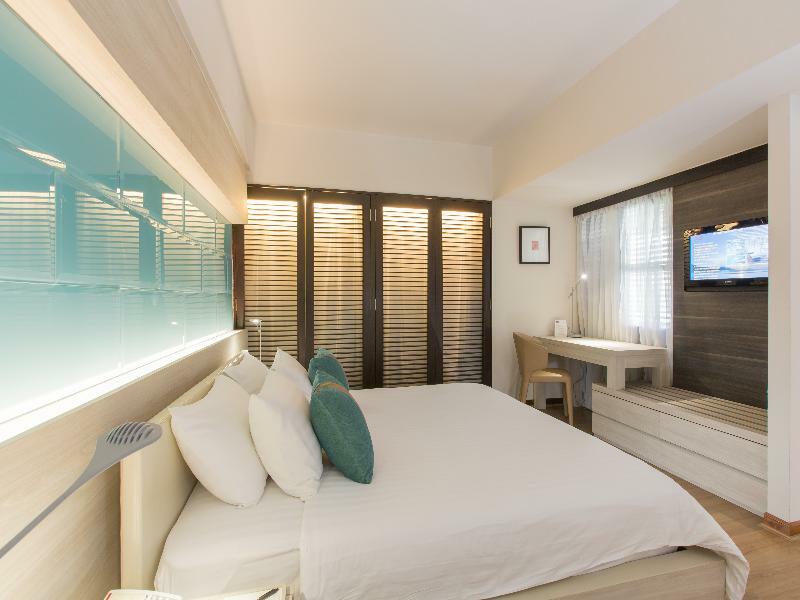 Our room was clean and tidy, perfect for what you want in Patong as you don’t spend as much time in your room! Breakfast was definitely the highlight as I am quite a fussy person the breakfast buffet was more then what I could of imagined and I compare it to crown casinos buffet breakfast in Melbourne! (It is amazing)! The pool was also very good we just stayed at the one near our room! Overall will definitely be returning and it is in such a good location. This resorts located at patong but it's silent enough during the night . This hotel is getting old require to upgrade. I saw them starting to renovating the hotel room . Everything is good but their breakfast require a lot more improvement in terms of quality of the food. Selection of food is a lot and perfect for bread , pastry & salad . But for main course for Asian food require a lot of improvement. Especially for noodle and rice. The location is superb, it is just few steps away from the patong beach & patong McDonald and 1122 pizza company. 5-8 mins walk to bangla road and 10-15 mins walk to jungcyelon mall. The place is quiet eventhough it is on the happening street, you still can enjoy your peaceful stay. Overall, the staff are very polite and friendly, you can get them to arrange for airport transfer if you wan, around 800b per way. Highly recommend to explore the seafood at night market opposite jungcyelon and boxing stadium. Remember to bargain the price,you can find a lot of street food there. Motorbike could be your choice of transport to bring you Around, 300 bath per day, need to leave your passport to the owner, so recommend to rent at shop instead of roadside, you may have peace of mind. You also can find water sport on the beach, also not to forgot to bargain the price. Great central location. Friendly staff. Lots of bang for your buck. Fav place I’ve stayed in Thailand thus far. **i will say to be wary of the taxi drivers in Phuket. First one got in a wreck while taking me from airport to hotel (he was speeding and texting.) At the end of the day, great stay! Great locations walking distance to everywhere, cross the street from the beach we always get the beach feeling while walking out the door, beautiful pools with the pool bar, The staff is very friendly great service smiles always helping on any requested we ever asked, my friend wanted me to make a comments she complained that the bed and bed sheet are too comfortable she doesn't want to get up and do thing. I will always recommended Ban Thai to all my friends and families. We chose this resort based on reviews but I guess everyones perspective is so different. I will start with the positives pool staff were helpful and friendly so was the lady selling tours, breakfast was good but they were never able to seat me straight away and they could improve a lot. Reception staff were abrupt and not interested. I don’t think it is 4 star maybe 3 it is very tired and worn and poorly designed there is a long walkway that leads to the lobby so if your room is in that part of the building you hear everything. Perfect resort if you love noise, sitting at a pool bar for 12 hours, swimming in urine from the people that have been at the pool bar for 12 hours and blood splatter on your robe. I am not saying it is a bad place it along with all of Patong didn’t appeal to me. But if you are the holiday maker that likes to go to the same resort every year and have never stayed anywhere else it will be perfect. If not give Patong a miss there are so many nicer places in Thailand. The resort is big and the room is not small. However, the building is still old and the bathroom is not clean. The pool is good to swim but all the first floor rooms are big and expensive rooms. The worst part is workers. They made us wait over an hour and a half to check in. Additionally, they said they would upgrade my room with additional pay, and we agreed. But later, they just lied to us that they never said and eventually, they admitted that they did, and still they can't upgrade since all room are fully booked. The workers were really trashy, rude, and undereducated. Espeically a old lady (maybe named Amy, not sure). Horrible experience ever here... I strongly recommend not going there.